Not long ago Nintendo announced that it was introducing a pre-download service to the Wii U eShop that'll kick off with Super Smash Bros. for Wii U; it'll eventually be utilised more and on 3DS in 2015. The exciting news is that details have been confirmed, meaning that fans of downloading their retail games will be able to jump straight into the brawler as soon as it lands on the eShop. Nintendo of Europe and Nintendo of America have both confirmed that you can pre-purchase the HD Smash Bros. right now on the eShop or through a download code from retailers — your Wii U will then pre-load the majority of the game's data when the system is on standby mode. On the respective launch dates systems with a pre-purchase will then automatically download the final data to unlock the game: this'll happen at midnight Eastern US on 21st November in North America and midnight CET in Europe on 28th November (11pm on 27th November in the UK). 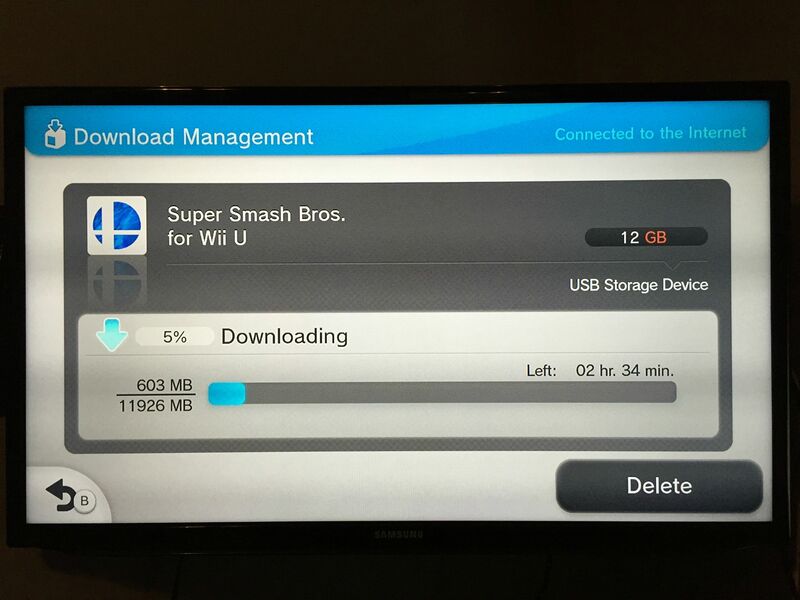 This also seems to have revealed the download size of Smash Bros. on Wii U, as the pre-download requires 17.2GB on our UK unit; you'll need to check you have enough hard drive space before pre-purchasing, of course. For those in the US that want to utilise the country's web store to pre-purchase the game, you'll receive a redemption code to pre-load the game within 72 hours of its release on 21st November. 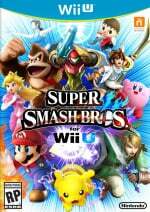 Are you planning to go for the download option with Super Smash Bros. for Wii U? Have you already rushed in and pre-purchased? Let us know. No, thanks. I'll get the physical copy instead. Hmmm I thought the game filesize was bigger. Nice. Go Nintendo for upping your digital game! Death to physical media! @Osiris11235 only if digital is cheaper!!! Only 17 GB? I was expecting it to push the media format, like how Melee was 1.3 GB on a 1.5 GB disc, and how Brawl exceeded the Wii's disc size making it a dual layered disc. Guess the lack of FMV made the file size shorter than expected. Yikes, that's huge. I will still probably preload it, but that's a large chunk of my available storage..
Wii U is the only gaming device that I actually want to own the physical copies. I don't have a real reason why. Was kind of hoping for a, perhaps even small, multi platform purchase discount. Would've been a nice gesture - not that mewtwo isn't a nice gesture. @Dipper723 Please get your facts straight. Your games are tied to an account, which is not tied to hardware. does that make this the largest Nintendo made game? Guys, don't forget the 15% eShop card discounts coming up at Best Buy. They stack with Shop Discover's 5% off all online Best Buy purchases, or the Twitter Deal where you can get $25 off of $250 spent at Best Buy on your Amex. Plus, Best Buy has rewards points. ALSO, this is on top of the 10% Digital Deluxe promotion. I ordinarily would download it but somebody already paid for a physical copy for me. Though just as well because that file size is much larger than I was expecting. So guys, can the prepurchase be done directly from the eshop store, or do we have to get the download code from a retailer? I'm not home to check/test this for myself, and I will definitley be going digital. @SanderEvers Okay, didn't know that, thanks. Sorry, didn't read the article properly, it should be available on the eshop also..
Not gonna download just yet, may wait until closer to the 21st, but yeah, being able to launch the game at midnight is awesome. My G... I was hoping to fit all my multiplayer games to the system memory. Now I will be forced to put this one on my external drive. That size is quite large, physical for me. Though this is good news for my friend since he plans on buying the digital version. Thanks for rubbing it in I am not home right now to start the download. I thought it was 17.2GB though? so the night of the release we have to download the other 5.2GB?? That will take forever! Nintendo needs a remote desktop app so we can remote in and start downloading from work. @Boxmonkey I actually disagree on that. I don't give much for a box and a disc as I'm usually very sloppy with stuff like that. The lowest price available here (Netherlands) is the same price as a download code I will buy online from Game UK. As I don't usually sell my games, especially games like this with a huge replay value, getting my games digital has big advantages: No spinning disc noise, no swapping discs, quickly being able to stop, choose and start different games from the Home menu. Great for games like Mario Kart 8 and Super Smash. Already started the download And for that matter I download every game now (if possible). Hate swapping discs out of the machine and love the digital promotion! 10% back is great. I use a 1TB external HD. It's good for the people who like having everything digital I suppose. According to the article the download size is supposed to be 17.2GB, but Spakiness showed 12GB in his pic. Can you confirm this as well? I see 12GB too. Not sure if UK has a larger file size? NA is 12GB. @MacMan @MacMan i think that it is 12gb now and the rest downloads when the game comes out. Great! 12GB is more reasonable anyways. My advice though, based on past experience, if smash is more important to you than your other games, save it on the internal storage. I lost all my data/savedata with an external drive on the wii u last year, so I plan to keep my two top games, smash and kart, on the internal storage, and the rest can go on my external. You have to have Nintendo's help in the transfer because games are bound to the account which is bound to hardware. So, in other words, games are bound to the hardware. It's just semantics to say otherwise. 17GB no thanks I was going physical anyway seeing as I may use the disc in several different Wii U consoles. @OneBagTravel not only that... we need a Nintendo app fro both desktop and mobile alike that allows remote purchases and downloads. Hope one's in the works considering Nintendo has a (lite) remote buy website. Europe has more languages so file sizes there are usually higher than NA. Are you freaking kidding me, NoE? The game is done and I can preload it now, but still I can only play it a week later than Americans?! I'm going to pre download. I buy all my games digitally and it's awesome. This is actually not a big deal, as that does not seem to be too painful a process. The biggest problem which we all suffer from, is the fact that the save data is also tied to the console. Therefore, if your console dies, say goodbye to your save data, regardless of whether you have a disc or the digital version. @OneBagTravel I'm pretty sure the download will start if you purchase it from the Nintendo online store? That's what the most recent Direct seemed to imply. That's cool but I am getting the physical copy that's bundled with the controller and the adapter. I will probably use this feature in the future. wonder if this means we can get a demo soon? That's why having a 32GB internal storage hardware is such a stupid idea. Why not just double it as a default? What about idiots, I mean people, who purchased the 8GB version back in the days? Man, Nintendo is a step back in basically every aspect of digital content distribution. At least the digital version should be 30-50% cheaper, so it would make people REALLY care about going digital instead physical. This almost makes me want to go digital for this game. Instead of picking up my pre-order after work and booting it up around 5 PM, I could try out the game before going into work Friday morning. Damn I love that Nintendo is fully embracing digital. So much better. Plus plastic (physical) is bad for the environment. @rushiosan putting 8 and 32 gigs in the wii u enables Nintendo to bring the price tag down, and if you never buy anything digitally, then you save that money. Having the option to simply plug in an external HDD is so awesome IMH. This way, I can completely customize the amount of storage I want, and how much money I want to spend on storage. Not to mention that storage gets cheaper almost all the time. If you waited a few months before buying you HDD (or using one you had lying around) then you've already saved money right there. @Tritonus It still fills up some space even if you move it to and external HD, and if I'm not mistaken, you still need to temporarily transfer the whole content as a "cache" to Wii U internal memory while playing. At least that's how most phones do today and how Wii used to. Not completely sure though. I currently have Pikmin 3, NSMBU, Mario 3D World, Shovel Knight, Wii Party U, Ducktales, and Bayonetta. Woof! HARD DRIVE NOT BIG ENOUGH. Getting physical, but I intend to use it for Captain Toad, although that may have a small filesize in comparison. But I want it the minute is available. @Boxmonkey just like 2 bucks cheaper would be awesome. I don't think that will happen until they need a boost in sales. With Black Friday and Christmas deals around the corner, I will wait to purchase a physical copy for less $$$. I'd do it right now, but I decided to go with the boxed version. I have the boxes of Melee, Brawl, and the 3DS game so I didn't want to skip out on this one. Tempting to a slight degree, but it's the same price for no box, manual, insert, physical disc, the game is tied to the hardware, & I fully support physical media, since they can be sold, collected, & played on another person's machine(like a friend's). If you like digital, that's fine. I prefer physical. I still wanna get Pikmin 3, even though I have it d/ld from the 1 free game, in the MK7 bundle earlier this year. It's only 11.6 GB in Canada. Hmmmm. I was going to get this physical then they announced this and I instantly bought it and pre-loaded it. damn haha. @rushiosan I currently have 9 gigs of free storage in my internal HDD, and I have plenty of games on my external HDD which greatly supasses that number, like assassins creed, splinter cell, and bayonetta, without any problems. I'm not sure what you are asking, but no, you don't need 16 gigs free on your internal HDD to play a game from your external HDD which takes up 16 gigs, temporarily transferring it... It loads straight from the HDD, with no lag issues, and in fact it slightly faster than reading from a disc, as far as I know. I currently have 175 gigs on my external HDD. No problems what so ever. 175 gigs of content that is. still got 325 gigs of free space. Now, 17GB is the biggest filesize I've seen for a Nintendo first party title so far. Correct me if I'm wrong. Digital copies still aren't worth their weight in gold at this point in time imo. @OneBagTravel because teal color of the cases look great on shelves? @Kirk PS4 and Xbox One doesn't have those limitations. Xbox One will cost $350 (dollars) this holiday. PS4 will stay $400 (except if you get a good deal somewhere). The Wii U is $300, and it's likely to get some great discounts in Black Friday. You can buy a Wii U and a 500 GB disk drive, which is around $40. It will still be cheaper than a Xbox One. Why not include price information in that news? I'm downloading it and it says 12GB. The e-shop says the game will be available to play on the 21st after a small update. Unless Nintendo is mental, 5GB is not a small update XD I hope the game isn't 17GB, I dont have enough space for that. @maneauleau is this your first WiiU retail game? @Osiris11235 But dat purty cover art. WAIT, WHAT DO I DO IF I ORDERED OFF NINTENDO.COM!?! yea.. no thanks i can't download mk8 dlc and have space for this with what I already have. If only the wiiu had more space but nope. maybe someday I will get a extended hard drive. I will get mines physical, getting this day one now. I will have to wait a little longer for amiibo though. Unless one comes with it? Well...apparently not many people care about Smash Wii U where I live, lol. Got myself a preorder, just gotta trade in a game or two to make sure I have some leftover money for the rest of the month. @WaLzgi where are you getting it with a free amiibo? Or are you USA? For all eShop downloads, the size varies between the download and the installed game. So my guess is that you download 12GB, and the small update allows you to complete the installation, expanding to the total 17GB. Good for Nitneod for letting people DL this 10 days in advance, very well done. I'm about to go buy MK8 DLC w/ a $10 eShop card I just bought at Target, I'm more of a wait until the last minute guy. And retail is always disc for me so no rush. Most are like $50 and $60 (brand new), but I'm expecting great discounts on Black Friday for HDD like the Seagate Expansion, which is one of the recommended by Nintendo for the Wii U. So a $40 price tag is not that crazy for this holiday. I have a one terabyte hard drive so I'll be going digital. I also want to be able to play it and any other physical game I own without swapping discs. I always want it on the Wii U ready to go, and this is one of the few game I can say that for. What worries me is that the highest Wii U capacity [that I've seen anyway] is 32 GB. I'm looking at getting one this holiday season finally, so is there external storage or anything of the like? @emiingham yeah, It really annoys me that I can buy it from an outside company for cheaper than going direct. I'd happily buy it directly from Nintendo if they lowered their prices. I mean, if Game can sell it cheaper, and they surely take a sales commission, Nintendo is losing money, so why not just sell it direct for £40, cut out the middle man! End rant. Haha, the eShop is down due to overcrowding. Brand new, 2TB, recommended by Nintendo and only $100. That's the one I got, and it've been working like a charm since 1 year ago. It's really expensive, though. I lasted 1 year saving for it. Crap! I barely have anything installed on my 32 gb model, and only have 11 GB left! Nice! This is the key reason I have been wanting to get this game digitally, though not wanting to have to change disks so much certainly helped with that decision! Either way I will be getting the download started as soon as possible! Digital pro: no noise from the disc drive. Disc drive noise is the one aspect of my Wii U that pisses me off. Plus no disc swapping. Physical pro: I like to build a collection of games that I'll keep for years. Who's to say how long WiiU games will be kept available for download once Nintendo moves on to new hardware? Then you're dependent on your hdds not failing. I would love to have the justification to buy Smash on release but I haven't completed any of my games yet, and have a backlog of Wii games too. I've bought Bayo1&2 recently and have only played an hour. Plus I prefer racing to fighting, so Mario Kart 8 dlc takes priority right now. Smash still looks awesome tho. Looks like now i really have to go buy a hard drive now for future games cause i want the download version of these games. Have so many games and im not into showing of collections like some people. I rather just have the download stored on the system itself. No scratches , no breaking , basically forever copy right ? I honestly thought the file would be bigger too. I always feel like Nintendo isnt taking advantage of their systems power. @Kirk Nintendo gives you plenty of options to up the size of either versions of Wii U's. SD card slot and USB external drives. @OneBagTravel The SD card slot can't be used for Wii U game storage (it works in Wii mode). Wii U can only store externally to USB. @gcunit I think when the Wii U is approaching the end of its life I will buy an extra HDD and backup my entire collection, just to be safe. I really hope that a future update allows us to store our save data on the Wii U hard drive. Time for Nintendo to introduce a new 128/256 GB model. It's kind of a drag having a separate piece of hardware hooked-up to my Wii U. After the disaster with my crappy download version for the 3DS version of Smash no thank you I would rather be safe than sorry and get the physical version. Besides I really dig collecting video game boxes for some reason. There's some pretty major limitations to what you can do with the SD cards and some people simply do not like having to plug in messy external pieces of hardware to their consoles. anyone finished the download yet? I know eshop games 'install' after they finish, where they basically get uncompressed to thier full size. What's the full size of the pre-downloaded game after you finish? That might explain the 12GB download and the eshop saying you need 15GB. @GuyWithTheGames I hope so...... everyone is saying the 3ds demo is the only one we'll get, that's dumb, Wii U Demo would be the size of the full 3ds game, which is funny. I just don't know. I'm not a fan of digital stuff. I actually like looking at game cases and disc art. Plus some games become valuable (looking at you Earthbound) so I'd much rather have a physical copy than a digital. @Light Have you readen the article? It says you pre-download MOST of the game's data. You wil download the rest once the game is out. And of course Nintendo Australia fails again by not offering pre loading. Might switch over to UK eshop because 17gb is going to take forever to download launch night. Or not as that means I won't get the club Nintendo soundtrack argh! I was gonna go with going out and buying it on release day, but since I can preload it so early and having digital games in my Wii U is very comfortable, I'm getting it digital this time, just like I did with MK8. Having digital games on my Wii U makes it a breeze to play on the gamepad while I'm on my bed since I don't need to get up to change discs, and late at night I can just turn off the console and sleep since I don't like to leave discs in the console overnight. My Wii U is the first system I've gone all digital with and I really appreciate it. Physical wins for collecting, though, and disc games are easy to find on sale whereas eShop version... are not. So pluses and minuses for both formats. Regardless, I gave this early buying a go and it seemed to work. I'm interested in seeing how Club Nintendo sees the purchase. 17.2 GB! sheesh how much do game discs hold nowadays! Wait a minute... wasnt there this big stink about one of the abe's world games being under 8gb? What on earth are the 8gb Wii U owners going to do! It took me 10 hours to download it. Is this available now then in UK? If so, how much is it? This would take like, 2 days straight to download it lol. Im never going digital with games that weight this much. @Thats-what-shy why? Mines tucked out behind the TV. Don't even notice it's there. And Ive got 4x the memory of a ps4 for half the price. Where's the problem? I only buy 'keeper' games on disc because I like having the boxes and seeing the box art. Boxed games are nowhere near as good as they used to be but I still like to have them. It's a good incentive by Nintendo to promote Digital sales for this game. Although I do like digital versions, I'll be buying the physical copy of the game myself. I'm going physical to get the Gamecube adapter at a cheaper price. Though, this is good for those that don't want a bundle. That is a big file size so will take a while to download. Jumping straight into the game on launch day instead of waiting, waiting, waiting is a great idea and I hope the eshop applies it to all preorder games in the future. I have also done the pre-order from GAME. No digital code so I'm not sure if I'll get the pre-download or not. Not even sure if I'm getting charged up-front, but £39.99 vs. £49.99 was a no-brainer. 17GB OMG. Sweet. Going to get an HDD with the game. £31.85 physical copy, £49.99 retail download. The choice is simple. Well I went against what I originally said and purchased the digital version. I figure this works better since Smash is a pick up and play game. It would save from having to swap discs out from my typical platformers or MK8. @maneauleau Retail Nintendo games are downloadable from the eshop too.. I was asking if this was your first WiiU retail/eshop purchase because those are 60$ new. Old news. @rushiosan yeeep, I'm such an idiot for buying that 8gb model. it's not like I could plug in a 64gb flash drive that I had laying around or any similar storage device for extra space... ah, oh well. that's what I get for being an idiot.